Do you have a favorite "print screen" app/method for your PC? One of the things I've long been in the habit of doing is saving electronic clips of things I think will be useful or important for me for the future -- Immigration stuff, retirement stuff, hobby stuff, and on and on.... Kind of like keeping an electronic filing cabinet. But the question arises, what's the best method to accomplish that on a PC? I've always wanted and looked for a program/app that made that process easy, and gave me options for different outputs, like sometimes saving as a file on my PC, other times going direct to a printer, etc etc... One key for me is that such programs can be automated to where either a default setting or quick menu choice will execute either a clip print or a clip save -- not a long process of manually opening a separate program, and executing a bunch of menu commands. Long ago, I started out using a really good paid program for that called Print Screen Deluxe, but it seems to be no longer in active development and the newer versions I don't care for as much, while the older versions I had already bought don't really work well with Windows 10. So searching around more lately, I came across another free program that's pretty lightweight and does provide the essential capabilities -- freeform screen clips and printing when desired. The latest app, which works fine in Win 10 and on 64 bit systems, is called Lightshot. About the only thing it's missing that I liked from Greenshot is the ability to shrink/enlarge the clipped content when printing, and to position that content at various page places (top, center, bottom). AFAICT, Lightshot doesn't allow that, but otherwise, seems to work and run pretty crisply. So the questions are, are any of you out there also PC content clippers (screen capture/print screen), and if so, what's your preferred method(s) of saving a clip to your PC and/or printing out that clip? Thanks!!! BTW, here's what a Lightshot screen looks like after you press the "Print Screen" button. You use your mouse to select the screen area you want to hightlight/capture, and as soon as you do that, the Lightshot command functions pop up along the edges of your image. As you can see, the bottom row of command icons provide functions to save a file, print the content, share or other stuff. While the right edge menu provides options for annotating the captured image. With Greenshot, once you hit the "Print Screen" button and selected your screen content, you got a popup menu with a list of options that included automatic file save, file print, and other options like sizing or placement on the printed page. Both Lightshot and Greenshot are running in the background, minimized, and can be set to auto start with Windows, so both can be always available with just a press of the "Print Screen" button. Yes, I have that, and have used it too.... But isn't it one of those kinds of programs where you pretty much have to manually open and run the program each time you want to use it??? Which for me, is a time hassle and waste I'd prefer to avoid. FastStone image viewer is a pretty nice program as well for managing / viewing / editing one's photos and photo library. same thing does this capture from a small taskbar up , lasso , rectangle and more , I use it simple way , but part of screen too , can try it if not good remove it, also I use the image viewer from same group which let you resize and many things whit the picture I am not so much a lay out user . once you installed it you can let it star with windows start up , and then it is positioned in the task bar , until you stop it or put it back in task bar down right , when open it is a small task bar up right with the controls , I just clikc on print scr key for direct capture opening for that up right task bar . Ahh... maybe that's why I was using the other free apps/program... 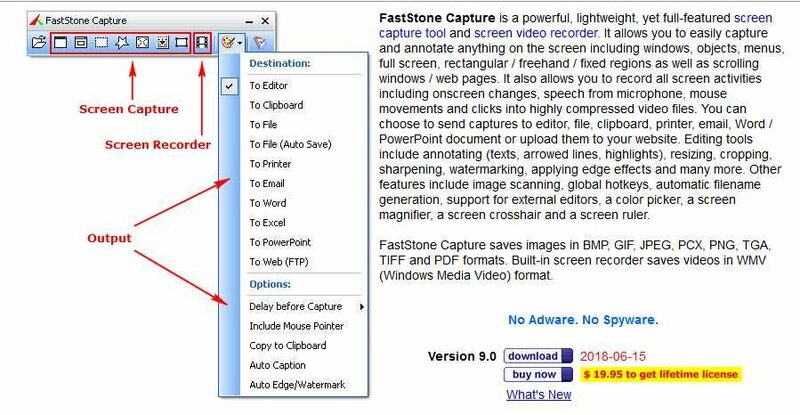 The Faststone Capture program is $19.95 to continue using after the 30-day shareware trial period. See how useful screen captures can be when traveling about ThaiVisa!!! Yep, Faststone Capture has a lot of the features I like/liked in Greenshot....which is free. The ability just by pressing the Print Screen button to autosave any clip that can be automatically given a year-month-day-time filename. Choice of file formats to auto save as, jpg, gif, png. etc. The ability to set an auto print function any time you do a screen capture. Choosing the default folder where images get saved to. Selecting the automatic settings for the image quality of the saved captures. Choices of type of capture -- whole screen, active window, freehand selection, rectangular selection, Etc etc. I've been using this for years. I usually capture a selected area or a window, haven't used any of the fancier features. If I need to edit I'll use my usual graphic program. Inside of the firefox browser I use Nimbus. It's ok, the ads are annoying. I just use the built in Snipping tool on Windows. You can open it from one of your F-keys so you don't have to look for it every time. Very easy to use really, I don't see the need for anything else just to save 2-3 seconds. No automatic save on hitting print screen button. No automatic print on hitting print screen button. For once in a while, it's OK. But for frequent and heavy use, it's a PITA! Not bad!!! Not one button to save or print captures... but at least only two easy clicks. Can run in background and auto start with Windows. Options for different modes of capturing. Options for where to save and what file types to save as. Options for changing the command keys to launch capture commands. Options for how to auto name the saved captures, such as using the Y-M-D format or other. But I'm confused a bit about its pricing. The website advertises the software as free. But when I installed it, I thought I saw something in the EULA disclosure that talks about it only has a 30 day free trial and then having to purchase or pay for a license. And yet in the app and on the website, I can't find any mention or route to that. Does the "free" program stop working after a month's use? The Nimbus add on for Firefox isn't bad either, but strikes me as a bit balky, and as you'd expect in an add-on, not as many available options, settings, customizations as in a regular app/program. Once you set the quick save options in its Settings, saving a captured screen area automatically to a file on your desktop is pretty easy and works well. Click the Nimbus icon in your browser add-ons menu area, select "Selected Area" from the dropdown menu to choose the type of capture, and then set the "action after capture" setting to default to download. Once that's done, it's two mouseclicks to get to the highlighting the screen area function, and then one final mouse click after selection to create/save the file. But the printing a screen capture outcome is a bit more complicated and obtuse. There doesn't appear to be any direct command to accomplish that. Instead, you follow the same directions as above to capture a file to your desktop. But once you get to the final step, instead of choosing the Save icon, you instead click the three dots icon to the right and that displays a Print command as one of several choices in a popup menu. Choose that, and that opens your printer command dialog box and allows you to order a print. 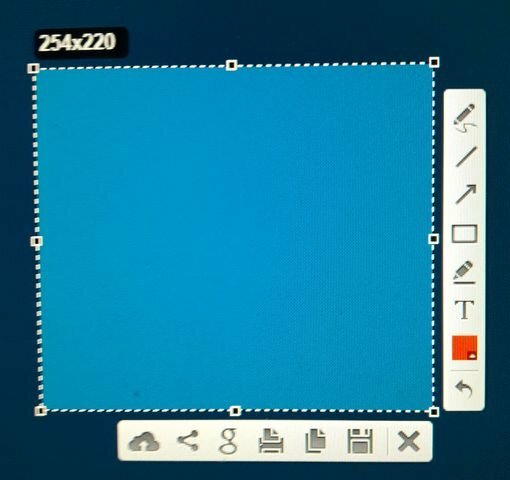 A single icon or command option just to execute Print would be a whole lot easier! With the free Lightshot program I mentioned above, once you hit the Print Screen button, you're automatically prompted to choose the area you want to save. And once you've used the mouse to capture the area you want to save, you automatically get an onscreen menu below the capture area that has single icons for executing both a file save and a file print function. It's fast and uncomplicated. The only part I'd like better is if the program's file save function just saved automatically with a predetermined naming method. Instead, file save brings up a Windows file save dialog box prefilled with the filename "Screenshot_X" with X being a number. So then you can either accept that file name or type in the name of your choosing. No automatic system to automatically save files with a year-month-day time type format. So that's one extra, albeit quick step. That's the one thing that I think is missing and would make this program more appealing for a heavy user. But when you choose a screen capture area and then hit the Print Icon instead, it just immediately brings up the standard Windows print dialog box and allows you to just do a one click OK to execute the print command.